The Ebenezer (African) Baptist Church congregation was organized in the spring of 1875 by the Reverends H.J. Chandler of the Bedford Street Baptist Church and James Nelson of Washington. Many of the church members, numbering about 15 to 20 at that time, worked at the B&O Rolling Mill. Worship services were held on the third floor of a building located between Mechanic and Liberty Streets in downtown Cumberland. This served the congregation until a real church building was constructed. 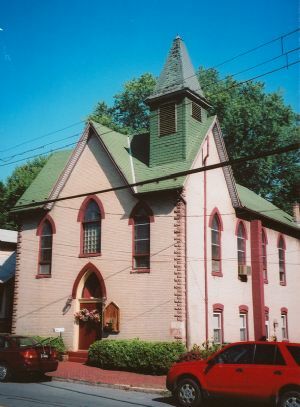 The original church building had its cornerstone laid in August 1875, was completed by 1878, and located on the north side of Cumberland Street just east of the bridge crossing over the former Baltimore and Ohio Railroad tracks. Cumberland historian Will Lowdermilk wrote that, "the building of this house of worship evinced a degree of courage and energy truly remarkable. At a time when there was a scarcity of money, and a prostration of business, the work was projected, and it was carried forward under trials and difficulties innumerable, by a class of men dependent on their labor for daily bread." In 1909 a new Ebenezer Baptist Church was erected upon the site and this served the congregation until 1999 when the Ebenezer Full Gospel Black Church relocated to a new site on Columbia Avenue. The former Cumberland Street church building now serves as a private residence. "On Sunday, June 20, 1909, the cornerstone of the new Ebenezer Baptist Church for Blacks, being erected on the site formerly occupied by the structure erected by the old congregation in 1878, was laid by the Star of the West, Lodge #26 A.F. and A.M. Mr. A. G. Washington was the "Worshipful Master". The ceremony began at 3:30 pm. Previous to the laying of the cornerstone, the members of Colored Masonic Lodge, the Odd Fellows, the Knights of Pythias, the Laboring Sons, and the Hod Carriers Union formed in line of parade on Market Street and headed by the First Western Maryland Band, marched to the corner of Cumberland and Smallwood Streets, near which point the new building was being erected."